The Library of Congress is host to the Chronicling America Historical Newspaper collection, a project sponsored jointly with the National Endowment for the Humanities. 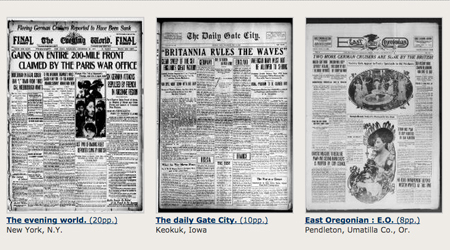 The collection features thousands of digitized newspapers from numerous states covering the years between 1789-1925. Additionally, the Library hosts digitized copies of the complete seventy-one-week run (February 8, 1918, to June 13, 1919) of The Stars and Stripes, a U.S. Army publication ordered by General John J. Pershing. To help students analyze historic newspaper articles, you can have them use the Library’s primary source analysis tool and the list of guiding questions provided below. Who published the article and who was the audience for this newspaper? (All newspapers in the Chronicling America Historical Newspaper collection feature an about section that contains background information). What type of article is this (eye-witness account, straight news article, feature article, editorial, column, reader contribution)? On what page and section does the article appear? What are the topics of other articles found on the same page or section? Is place relevant to this article? How? Are one or more dates listed in the article? Was this article written at or around the same time period that the text relates to? What information is highlighted by the headline and other text callouts, if present? Are there any photos or illustrations? What additional information or explanation do they provide? What does the text describe, explain, or provide an opinion on? What is the main idea of the article? List several facts or arguments that support the main idea of the article. Is this article a news story or an opinion piece? Is the article trying to inform or persuade? How do you know? Are there details that reference other people or events of the time period? What was happening during this time period? Who do you think was the audience for this article? What evidence supports your conclusion? If there was information about the author included, does that information suggest certain biases that person might have had? What do you think those biases were? Examine the the words and phrases the author uses. Does the author’s language support a particular perspective? Are different viewpoints presented? Why do you think the author chose to include these specific details of description or explanation? What information or perspectives might have been left out of the article? What source or sources does the author quote or refer to in the article? Do you think these sources are reliable? Why or why not? What evidence supports your conclusion? Does this article show clear bias? If so, towards what or whom? What evidence supports your conclusion? If someone wrote this text today, what would be different/the same? What did you learn from examining this article? Does any new information you learned contradict or support your prior knowledge about the topic of this article? Please feel free to download and distribute the Newspaper Article Analysis Guiding Questions document and the primary source analysis tool (but please keep the formats, including logos, intact).